Noblesville, Indiana, is a city in Hamilton County. It’s also Hamilton County’s county seat. Residents call their community “The Heart of Hamilton County” because it’s right in the middle of the county. With a population of over 60,000 people, Noblesville is Indiana’s 14th-largest city. It’s approximately 28 miles from Indianapolis; therefore, you can commute to the larger city via the highways Interstate 465 and Indiana State Route 37. Noblesville locals refer to their city as a “hipstoric” place. That’s because it combines history with a hip environment, particularly in its downtown area. Noblesville Square has a courthouse that was constructed during the 1870s. This three-story building features a clock tower and a jailer’s residence. Its cultural arts district is filled with many boutique and antique shops that are great for window shopping or buying a gift for a special someone. A block away from the square is the Nickel Plate Arts campus, a place where you can view and purchase artworks. The White River is a very popular body of water in Hamilton County, and it’s so popular that locals and visitors love to ride river tubes, kayaks, or canoes on its waters. If you decide to go on a river trip yourself, be prepared to see interesting wildlife like bald eagles, turtles, hawks, and herons. The Ruoff Home Mortgage Music Center is a hotspot for outdoor festivals and concerts. This amphitheater can hold over 24,000 audience members. Noblesville is home to 13 public and private schools: seven elementary schools, two middle schools, two high schools, and two Catholic schools. Over 70 percent of homes in Noblesville are single-family abodes. 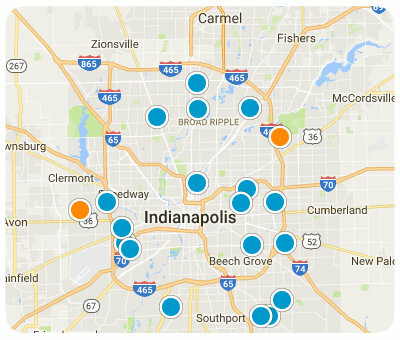 Other Noblesville real estate properties include apartments, mobile homes, and townhouses. Most homes here are quite new since they were built after the year 2000. Many residences have an average of three bedrooms, though other homes have more or less. Make Noblesville your new hometown. This community is safe, has great schools, and it’s hip and historic, or as the locals like to say: “hipstoric.” If you want more information about homes for sale in Noblesville, Indiana, please contact us today.